I haven’t been in the habit of using an eye cream for a while. I take really good care of my skin, but when I’m in a rush little details like this one fall by the wayside. This one fell to the side for me for so long that I didn’t even have an eye cream laying around to grab when the first of the cool weather hit this fall/winter. I splurged at Sephora a while back on the Volition Beauty Helix AM/PM Eye Gel. I’d been wanting to try more from this brand for a while, it’s green, it has great reviews, and I like a few other products by them. So what did I think? My all time holy grail eye cream is the Clinique All About Eyes. I love the hydrating qualities and I love how it immediately sinks in, making fine lines and wrinkles disappear. My eye area looks and feels soft and younger when I use it. Makeup wears beautifully with it. The only thing I don’t love is that it’s not considered a green beauty product. I’m about 80/20 with my makeup stash so it’s not a deal breaker, but I’ve made a deal with myself that I’m not buying anything new unless it meets cleaner criteria. So…the search is on for a replacement! 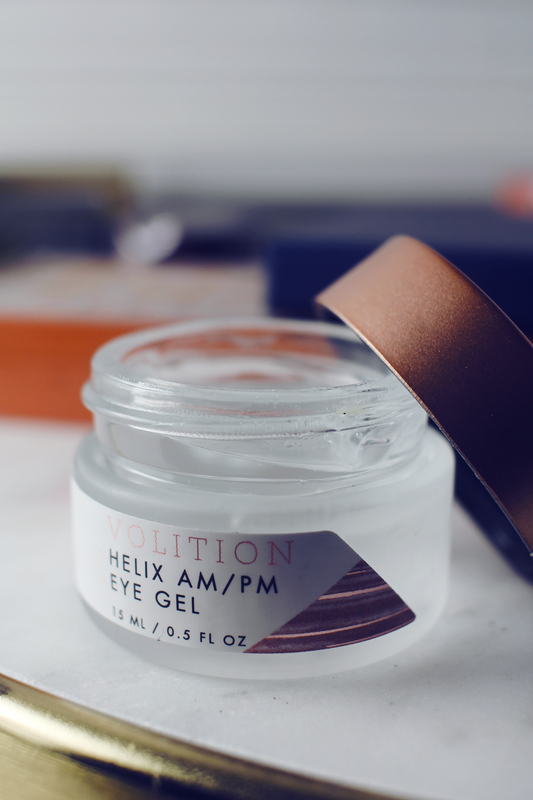 What does Volition Beauty Helix AM/PM Eye Gel claim to do? 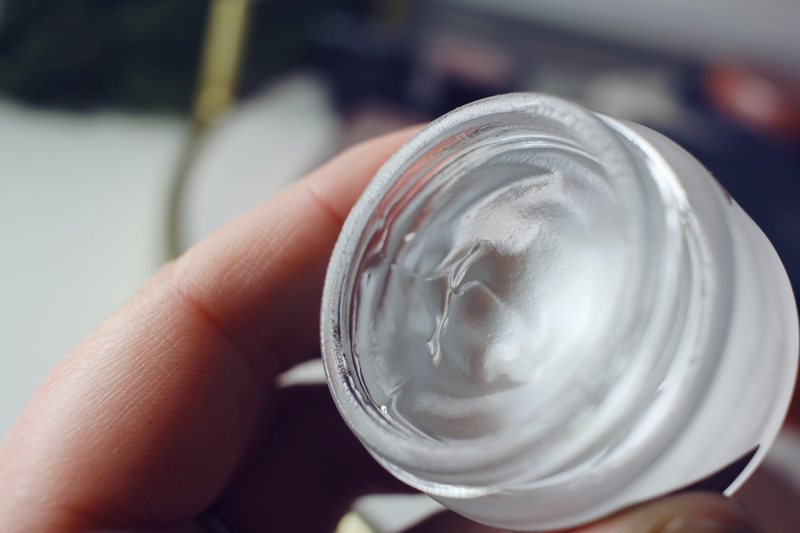 This eye cream is meant for every skin type- normal, oily, combination, and dry. It’s meant to be a solution for fine lines and wrinkles, puffiness, and dryness. During daytime use, it’s supposed to act as the perfect primer under makeup to visibly blur fine lines and wrinkles around eyes, and at night it’s supposed to have powerful ingredients that hydrate, renew, and promote healthy and youthful-looking skin. How does it stand up to its claims? I have normal/dry skin that tends to be sensitive in the winter. I have very little if any concern for fine lines and wrinkles. I can be puffy during allergy season, and I can be dry. I am mostly concerned with the area remaining soft and youthful looking, and with a flawless makeup application. The texture of this is like a silicone primer. It makes a great under eye primer for makeup application. It visibly blurs everything and creates the perfect canvas for makeup to sit on top of, crease free. As far whether it is anti-aging long term? That I’m not sure about. I’ve used it for several weeks but I’ve not noticed any decrease in aging concerns. It softens my features when I apply it, but I think the texture is what does it, not any special ingredient list. A little goes a long way. I’ve been using it for weeks and I’ve been pulling product from the cap every time, rather than dipping in to the actual container. It’s going to last me a long time! Would I recommend Volition Beauty Helix AM/PM Eye Gel? 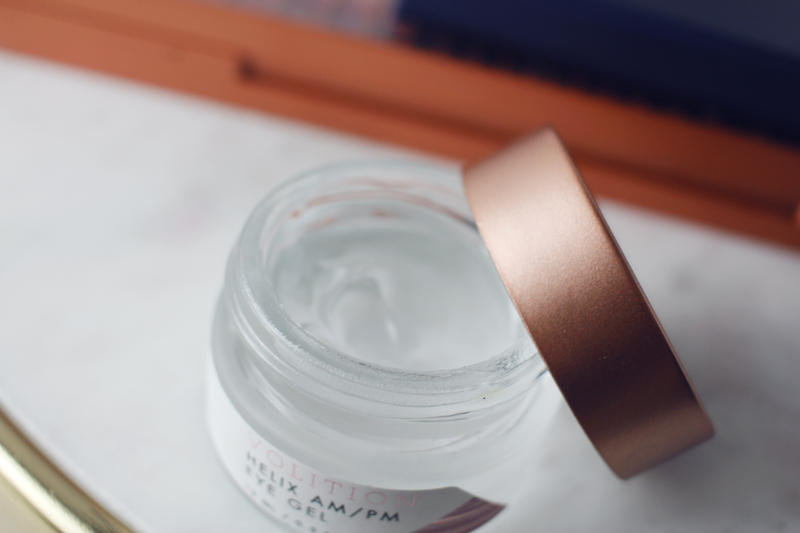 If you are looking for a clean beauty eye cream, I think this one is really great! I recommend this for daytime use, because I love how beautifully makeup lays over top. I am 32 and think this is a pretty good eye cream, but if you have anti-aging concerns, I don’t know how well you’ll love this when looking for those long term results. At $52, it ain’t cheap but it will last forever. Biossance Squalane + Peptide Eye Gel is a really good find! I went through a pump of this in its entirety last year. Good stuff! I remember LOVING 100% Pure Coffee Bean Eye Cream, but I haven’t tried it in at least 6 years. I remember a fabulous coffee aroma and how super soft it left my eye area. My next buy will be from Beautycounter. I’ve been enjoying their skincare and I’m eager to get my hands on the Countermatch Eye Rescue Cream. Have you tried anything by Volition? I really like this brand! I have used their Snow Mushroom Water Serum and also their SPF which I love. What do you think of this eye cream? Sound off in the comments below!